This unbiased review regarding the Crypto Money Maker scam serves as a public service announcement for the cryptocurrency community as a whole. Headquartered from CryptoMoneyMaker.biz, Crypto Money Maker is the latest investment software to plague the cryptocurrency domain with deceptive falsehoods and infectious illusions of grandeur earnings. As you will learn throughout our transparent review, Crypto Money Maker is a feeble scam operation at best and should be avoided through any measures deemed necessary. Crypto Money Maker is an online trading system that is geared towards taking advantage of the soaring popularity of the cryptocurrency industry. Strategizing their marketing tactics to induce pressure while promoting promises that are simply too good to turn down, Crypto Money Maker was carefully formulated to mislead newbie crypto investors out of their hard-earned money. Allegedly operating as a system that exploits blockchain for profit, the creators behind this scam system propose that the utilization of their software is 100% free when in reality it is nothing more than another broker deposit scheme. Where investors who fall victim to this scam end up having to fulfill a deposit requirement set forth with one of Crypto Money Maker’s supported brokerages. After an investor completes the deposit process with one of their untrustworthy brokerages then are they entitled to employ the Crypto Money Maker trading software where they can allegedly profit $1,350 per day by using their system. As most of you can probably deduce for yourself, none of these supported brokerages are regulated or licensed investment platforms and are composed as fraudulent CFD based trading brokerages that will do nothing other than steal your deposited capital and sell your personal and financial information off to the highest bidder. There is no information regarding the owners, operators or an alleged corporate entity anywhere on the Crypto Money Maker website. According to their Terms and Conditions page, CryptoMoneyMaker.com is operating as their sole entity and will not be held responsible for any circumstances that may unfold while using their system. In addition, a WHOIS report will indicate to us that their site was privately registered so we are unable to find information regarding the registrar behind the site. Does the website promote unrealistic returns? Yes, Crypto Money Maker claims to enable investors the ability to accrue over $1,300 per day by using their trading system. While it may not be evident to newbie investors, it is obvious to us that Crypto Money Maker is just trying to entice gullible investors out of their money to further line their pockets through broker commissions. According to a WHOIS report, CryptoMoneyMaker.com was created on November 6th, 2017. Privately registered, the creators behind this scam operation used NameCheap, Inc to register their domain and employed a privacy package. Does the site share any contact details? No physical addresses or contact details are disclosed anywhere on the Crypto Money Maker website. Crypto Money Maker claims that their trading system “exploits blockchain for profit.”As of lately, we have encountered numerous cryptocurrency based trading systems that assert this very claim but just like Crypto Money Maker they end up being scams. Besides their brief statement on their site, no other information regarding how their system functions is disclosed. Are they any discrepancies discovered amongst the website? When investigating into Crypto Money Maker we found a few discrepancies that couldn’t be overlooked. First and foremost would be the tactless employment of pressure inducing scam widgets such as the ridiculous “Spots Left” widget along with employing fictitious testimonials in a fruitless attempt to acquire credibility and gain prospective investor trust. Furthermore, the income claims made with this site are ill-founded and carelessly asserted. CryptoMoneyMaker.biz possessed a SimilarWeb global rank of 549,239 with a Germany rank of 85,945 as of January 28th, 2018. According to the report, Crypto Money Maker has not experienced an organic growth in traffic while over 50% of the sites total traffic is derived from advertised displays featured on the web. Can Crypto Money Maker be Trusted? Given the evidence provided above we know for certain that Crypto Money Maker is not a trustworthy or legitimate investment system. Incorporating phony user testimonials in an obvious ploy to gain your trust while operating as a completely anonymous entity just goes to show that nothing is genuine about this investment solution. 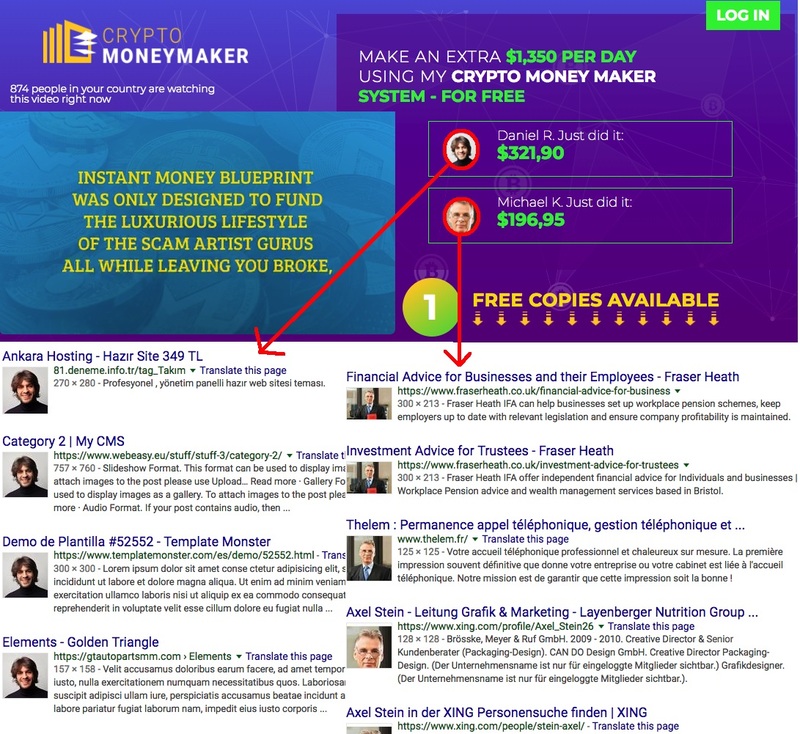 Crypto Money Maker is a pitiful scam operation founded by low-life scam artists. Targeting the newbie investor demographics, this trading software promotes not only unrealistic returns but also functions as a classic brokerage deposit scheme. Only financial loss and hardship awaits those who are gullible enough to invest with this deceptive cryptocurrency software. Review Verdict: Crypto Money Maker is a SCAM! Do you possess any valuable insight or experience to share regarding Crypto Money Maker? Please disclose any knowledge, feedback or opinions you may have by leaving a comment below! Searching for more legitimate alternatives for supplementing your income through cryptocurrency investing? Visit our complete Cryptocurrency Trading Center to learn about the best solutions readily available for you. Hi Guys, thanks for the review on Crypto Money Maker. Just a heads up that you are displaying a Banner of theirs at the top right hand side of this web page, giving them some legitimacy. Because the advert is on your page it made me think they are legit until I did a search on them here and found your scam review. Thank You Guys for sorting this out, you are my GO-TO team when I need the right kind of info. Many thanks.